Selecting building elements for commercial projects can be as much an exercise in compromising as it is in creativity. While architects and designers have a particular vision in mind, this has to be balanced with meeting environmental standards, ensuring ease of installation and minimising the need for maintenance and repairs throughout a property’s life. What’s more, specifiers often have to select from a range of products that may not fully meet their needs, having to opt for a solution which is the best fit, rather than the ideal one. 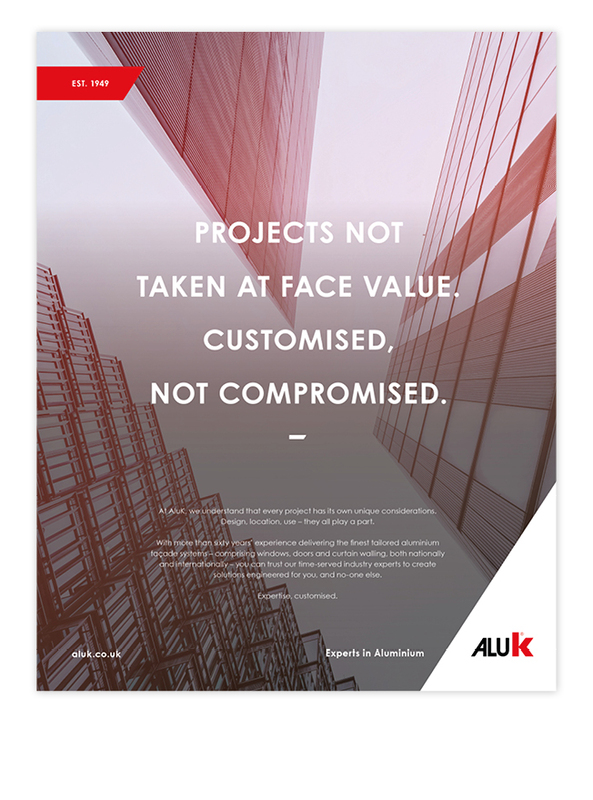 Breaking the mould, AluK designs and engineers aluminium building systems which are created in line with their clients’ specifications for the right result, every time. Our task was to raise awareness of the brand, its products and their benefits within the commercial sector, making aluminium the material of choice for specifiers, not just an alternative. Addressing the drawbacks of other systems head on, we created a concept which focused on the design flexibility which is only possible when working with AluK and its products. Crafting a unique visual style and tone of voice for use in all commercial communications, we then devised a campaign centred around the headline ‘Customised, Not Compromised’. The first rollout of this was in a number of audience-specific print adverts – for instance, architects were targeted with “Landmark Projects, Customised, Not Compromised”. Visually, the executions made use of in-situ product photography with a consistent treatment applied to each image. The subject matter was then selected to reflect the target audience, from striking architectural shots to in-progress site photography for use in the construction trade press. 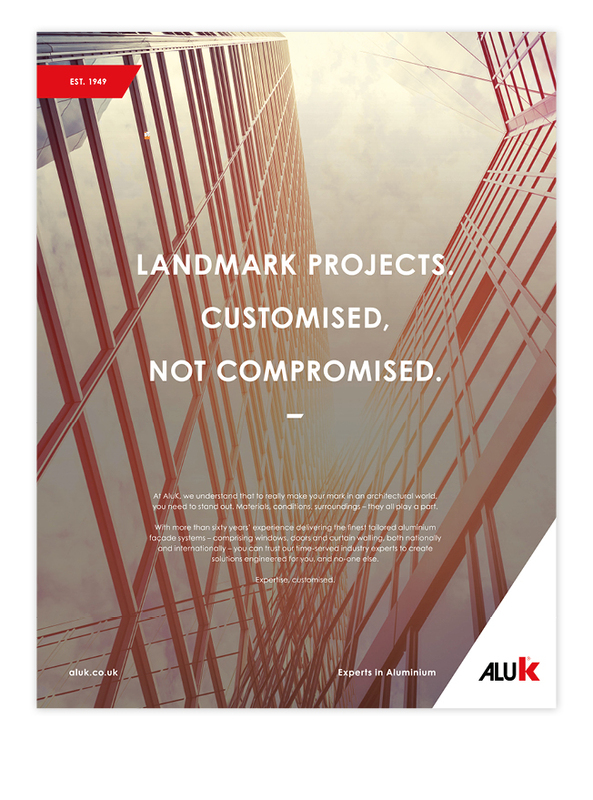 For the first time in the UK, AluK now has a distinct brand identity for the commercial market, with an authentic and unique visual style and tone of voice. Alongside the ‘Customised, Not Compromised’ launch campaign, this identity was used across a range of literature and product campaigns, ensuring consistency throughout all communications.